Why Ya Gotta Be So Rude? “Why ya gotta be so rude? Don’t you know I’m human too?” This song is so catchy right now. I can’t help but turn it up and sing along…and it got me thinking (fancy that). We don’t know the story behind why the dad is not giving his blessing to marry his daughter. He may have a very good point. We also don’t know if she even wants to marry the guy or if Dad’s replying truly rudely or just being protective and direct….but I DO love the premise behind the song. Why do people have to be SO rude? I’ve come to realize that blatant rudeness is just disrespect plain and simple. It shows lack of self control, lack of decency, lack of respect…just lack. I used to be attracted to rudeness, maybe because I thought it showed superiority in some way. I just assumed if the person was rude they had every right to be. Now, I see things very differently. 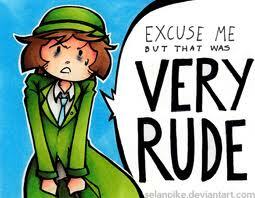 I’m completely repelled by rudeness, it’s just not necessary. There are ways to do and confront hard things without being rude. Turns out you can disagree with someone and not be rude. You can express your own personal opinion and not be rude. You can say “no” and not be rude. You can confront really hard issues and not be rude. People will respect you SO much more if you can express yourself, be yourself, stand up for yourself and NOT be rude. It may be extremely tempting to roll out the rudeness, but it’s just not necessary. It’s disrespectful. If you disagree, express, decline, confront, or end something in a polite manner and the person is offended and angry, that’s their problem. You have every right to make decisions in your life and they do too. It’s HOW we navigate these situations that show respect for others and ourselves. Remember to respect yourself, we people pleasers have a very hard time with this one….